Dropping a headphone jack has been a massive event. Not only is requiring users to listen to music via a Lightning port controversial, but it also creates a problem many power-users immediately recognized; how can I listen to music and charge my phone at the same time? Some may say this is a foolish question. I mean, when you’re out and about, you usually don’t charge your phone, you just consume media/audio with your new iPhone 7 compatible headphones. Then, when you are back home or at work you can plug your iPhone 7 in and listen to music through your computer. For many Apple users this is how they will go about their lives. Heck, as I’m writing this article I’m listening to my iTunes via a 3.5mm port in the back of my Mac Mini while my phone sits charging on my desk. Still, maybe you’re home computer doesn’t have a headphone jack, or you just don’t have your music on it. This is most likely to be the case for people have to switch between work computers and personal computers. Many companies have strict policies about downloading music on work machines, so maybe you go to work and your iPhone is the only way to access your personal music collection. Likewise, maybe you like to use and iPhone but have a PC and your music isn’t synced. Regardless of the situation, there will be a group of people who need to be able to charge their phone and also listen to their music at the same time. We’ve broken down 3 ways you can listen to your music while charging your iPhone 7/7s at the same time. We’ve written before on why we are so pumped about Lightning audio, primarily because we just love high-definition audio. The new batch of headphones built specifically with the Lightning cable in mind promise to provide a whole new level of listening experience. We’ve also written why we personally aren’t a huge fan of Bluetooth, in particular the Apple Airpods, which we think are going to lack the audio fidelity we prefer. That said, if you don’t really care about your frequency range or know the impedance of your headphones, then Bluetooth is probably a great option. Really, audio quality is the only big drawback of Bluetooth headsets, but most people aren’t audiophiles, so this may not be a huge deal for you. If you just need music while at work to distract you from the noise around your cubicle, or if you need something while working at your home office while your phone charges, then a Bluetooth headset, either over-ear headphones for long-wearing comfort or in-ear earbuds for portability. There are literally hundreds of options for high quality Bluetooth headphones out there. CNET has rounded up some of the best Bluetooth headphones out there. With your music being transmitted wirelessly to your ears your phone will be able to be plugged in charge at the same time, making everyone happy. If you need to experience the amazing experience of 24-bit audio and don’t want to sacrifice audio quality just to charge your phone then you can consider getting a dongle to allow you to do both. Yes, there is really a dongle for pretty much anything. Longtime maker of quality Apple accessories (anyone remember buying radio transmitters for their iPods?) 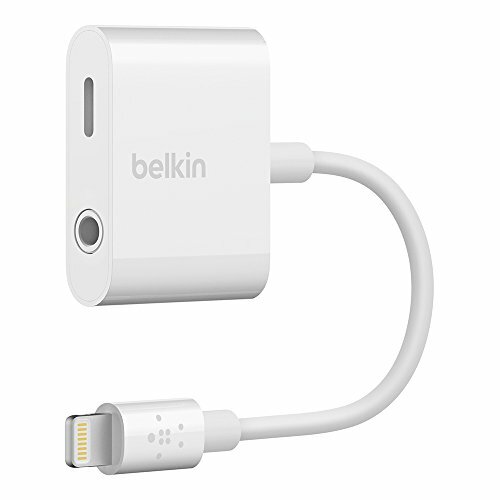 Belkin has already released a dongle that allows for simultaneous audio listening and charging. The Charge Rockstar is pretty simple but effective. One end has a male (the type that does the plugging) Lightning connector that you plug into your precious iPhone. The other end has two female (the type you plug into) Lightning ports. This means you can run your Lightning cable headphones in one port, letting the phone transmit your dope beats while simultaneously receiving a charge via the second female port. Yes, seems there really is a dongle for everything.. The Charge RockStar retails for $40, supports the full 48kHz, 24-bit audio quality Lightning is built around and also maintains mic support for the headset that is plugged into the adapter. Pretty simple stuff, making working tolerable for iPhone 7 users. The small size of this adapter is what is really useful as it can be thrown into a purse or backpack so that if you have an external battery pack (seriously, who doesn’t these days?) then you can be charging your phone on the go without compromising the ability to listen to audio as well. This is a godsend for frequent travelers or people who love watching movies on their phones, as battery life is a premium and being able to charge with a battery pack is critical. If the reason you are upset about the removal of the headphone jack is because you usually charge your phone when you get to the office and also listen to your personal iTunes collection at the same time then the updated Apple Lightning Dock is the tool for you. Just like other Apple Lightning Docks the design is beautiful and minimalist and will look handsome on top of any desk or as a supplement to any professional work space. The dock is small and discreet and allows your phone to stand upright, so you can quickly and easily view updates or navigate your dope tracks. At $49 it’s only about $10 more than the Belkin Charge RockStar but looks waaaaay better. If you don’t need to charge and listen to music at the same time on the go, then we’d go with the dock in a heartbeat. The back of the dock has an Lightning port where you’ll plug it either into your computer via USB or Firewire or directly into a wall-outlet for power. It also includes our old friend the 3.5mm headphone jack! So if you buy the Apple Lightning Dock you can use your phone, listen to music AND charge all at once. We really like the dock solution because it makes your beautiful new iPhone a fixture piece on your desk. If you spent so much money on a piece of engineering, it’s a shame to leave it in your pocket or laying haphazardly face down on your desk. Mount that beauty up on the dock and leave work happy (because you’ve been listening to that new Drake you love all day) and with a fully charged phone. It’s a win-win situation. If you want to be truly prepared for any situation, then get yourself both the Belkin ChargeStar AND the Apple Lightning Dock for your desk. This way you’ll be able to do whatever you want whenever you want. Sure, it means spending another $90 or so but hey, you just dropped almost $1K on the phone itself, probably another $20-50 on a shiny new case and probably another $25 on that big battery pack you picked up for your last phone that couldn’t hold a charge. What’s another $90 at the end of the day?